Tanzania Minerals Corp. (TZM) and Twigg Gold Ltd. (“Twigg”), who announced plans in April 2014 for TMZ to acquire 75% and 90% interest in Twigg’s existing Tanzania gold projects in Igurubi and Msasa respectively, have agreed to an extension of 30 days for the due diligence period. According to President and CEO of Tanzania Minerals Corp., Robert Dzisiak, the two projects are encouraging prospects with significant amounts of funding already spent on exploration and drilling. Tanzania Minerals Corp. is an emerging junior exploration company that is already traded on the TSX Venture Exchange. 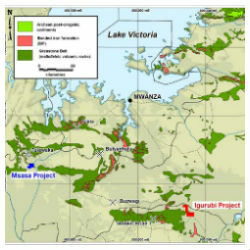 Twigg Gold Limited is a subsidiary of Blackdown Resources (UK) Ltd, a registered, private mineral resource company that is concentrated on the exploration, development and ownership of Tanzania nickel and cobalt projects. The extended due diligence period for the Igurubi and Msasa projects is scheduled to end on August 21, 2014.